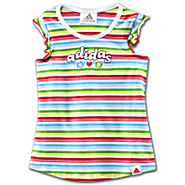 Adidas - Candy-bright stripes and soft pleats at the shoulder add a whimsical touch to the adidas Pretty Pleats Tank. This adorable tank top features a racer back design and is styled in soft cotton with a touch of stretch for comfort. 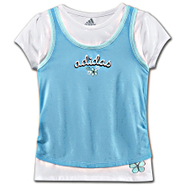 Adidas - Two cute looks come together in one with the adidas Layer Up Top. A bright and colorful tank slightly ruched at the waist covers a sweet white shirt with a cheerful flower detail peeking out at the hem.